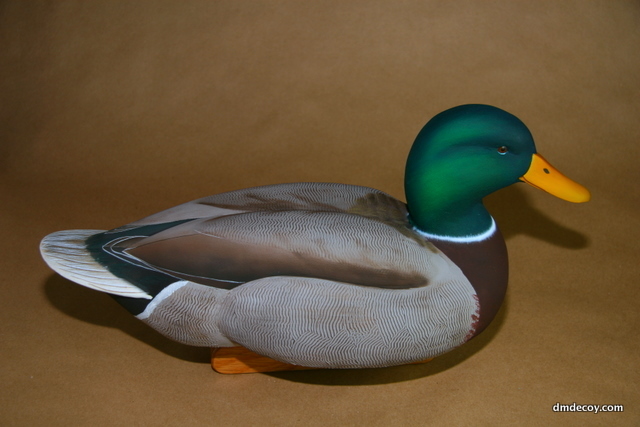 Here's a barrow's goldeneye I carved a few months back. I haven't posted in some time, mostly becuase I've been working on competition birds, and I don't like posting them while I am competeing them. The good news is that I'm doing ok in the competitions. I won second best in show for gunning birds with my low head mallard at the Core Sound contest in December. In February I headed down to San Diego for the PSWA show. I ended up placing in the best of marsh, but my standard head mallard didn't make it any further. Then it sold so that bird is done competing. I'm headed to Westlake, OH tomorrow for the ODCCA show. I've got some birds to compete in the pool and the IWCA tank, but here are few birds I'm bringing just to display and sell. One of these is going into the Firday night swim and sell, sponsored by the decoycarvingforum.com, and other will be displayed in Dwane Ong and Tom Matus' room 123. Stop by and check them out if you are at the show. This is the 2nd Best of show win for me this year. If I win one more contest in the intermediate division I'll have to move up to Open competition. I may just just jump into Open anyway. These mallards took first and third best of show in the IWCA novice category at the PDFA show this past weekend. The drake was first and the hen was third. This one has been in the works for a while now. I base coated it ages ago, then set it aside. I finally finished it up this week and I'm pretty happy with the results.